Section 39:3-50 of the New Jersey Statutes deals with operating a motor vehicle violations while under the influence of alcohol, narcotics, hallucinogenics, or habit-producing drugs. The penalties you face for driving under the influence of alcohol depend on how high your blood alcohol content was at the time of your arrest and whether this was your first offense. If your blood alcohol level is greater than 0.08 percent but less than 0.10 percent, you will be fined between $250 and $400 and lose your license for three months. You will also be required to participate in the Intoxicated Driver Resource Center program for between 12 and 48 hours. The court also has the discretion to imprison you for up to 30 days. If your blood alcohol level at the time of your arrest is greater than 0.10 percent, your fine will increase to between $300 and $500 and you will lose your license for seven to 12 months. You will still face 30 days’ imprisonment and need to participate in the Intoxicated Driver Resource Center program. Though driving under the influence of alcohol is the most common violation of NJSA 39:4-50, the statute also prohibits driving under the influence of habit-producing drugs like narcotics and hallucinogenics. The penalties for first-time driving under the influence of drugs are the same as for driving with a blood alcohol level over 0.10 percent. It should also be noted that there is no minimum level of drugs you must have in your bloodstream to be considered “under the influence.” Any amount that impairs your ability to drive is sufficient. Insurance Points A NJSA 39:4-50 conviction (or a guilty plea) will result in the addition of nine insurance points to your driving record. These points are different from the Motor Vehicle Commission points that are given for some driving offenses. They are used by New Jersey insurance companies to determine whether they will cover you and, if so, how much you will need to pay. If you get too many points, you may find that no insurers are willing to cover you, and you will be forced to buy insurance through the more expensive New Jersey Personal Automobile Insurance Plan (NJPAIP). What to Do Driving under the influence of alcohol or drugs is a serious charge, and you face severe penalties if you are convicted. A New Jersey DWI attorney can make sure your rights are protected. Call Dan T. Matrafajlo at (908) 248-4404 for a free evaluation of your case. All across central New Jersey, including: Elizabeth, Newark, New Brunswick, East Brunswick, North Brunswick, South Brunswick, Union, Woodbridge, Linden, Roselle, Roselle Park, South Plainfield, Dunellen, Middlesex, Piscataway, Plainfield, Metuchen, Perth Amboy, South Amboy, South River, Old Bridge, Hillside, Somerset, Sayreville, Cranford, Kenilworth, and Clark. Can people tell if someone is drunk based on slurred speech? 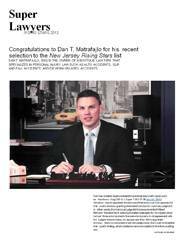 Dan Matrafajlo one the best attorneys ever I was completely satisfied and he has one of the best teams working for him .. Very professional. I highly recommend it to anybody.